Apparently it’s not spring yet… we woke up this morning to another few inches of snow. This is in addition to last week, when we got around 7 inches. Yes, the date is April 24th! The bees are just waiting to get out there and snag the aspen and willow pollen. I thought I’d post a few rare photos! April 19th! I’ve never skiied to a beeyard this late in the year before! There’s a myth bees get disoriented in the snow, mistaking it for the sky and crashing and freezing. Despite the snow, there’s a pretty good pollen and nectar flow going on and on Thursday, April 20, these bees were working hard bringing it in. It’s not often we get warm weather with solid snow cover to test this myth but I hope these photos demonstrate it is a myth. Bees can navigate just fine with snow. They do flip upside down and crash when they’re within an inch of the surface, but then they flip back upright and fly away. If they stay above that height they’re fine. Close up of a coupe hives flying hard in 8 or 10 degrees C with almost solid snow cover. A nuc from June 2016 I experimentally “neglected” all summer 2016 and winter 2016-2017: they have a full open entrance on both the front and back bottom of the hive, a crack running along the back between the two brood chambers (seen in photo), and no top entrance. I didn’t take honey off them over the summer, didn’t feed them in the fall, and didn’t medicated them. I watched them pretty closely all winter and was ready to give them help if they needed it, but here they are, bringing in pollen with solid snow cover. While the dandelions were blooming I was building new hives, called nucs, from my full-sized ones. I don’t have many hives this year and building nucs is a way of increasing hive numbers. Increasing involves two distinct procedures. As we know, in order for a hive to thrive it needs two basic thing: lots of bees of different ages and a laying queen. So when we’re increasing our number of hives, we need to concentrate on these two things. Firstly, we need to build nucs, which means populating an empty box with lots of bees and frames of brood to achieve the requirement of having a lot of bees of different ages. Secondly, we need to graft, or breed, queens. These steps occur simultaneously and need to be carefully timed so everything comes together in the end, with the result being a happy new hive. The rest of this post will give a brief overview on how to graft queens and how to build nucs. 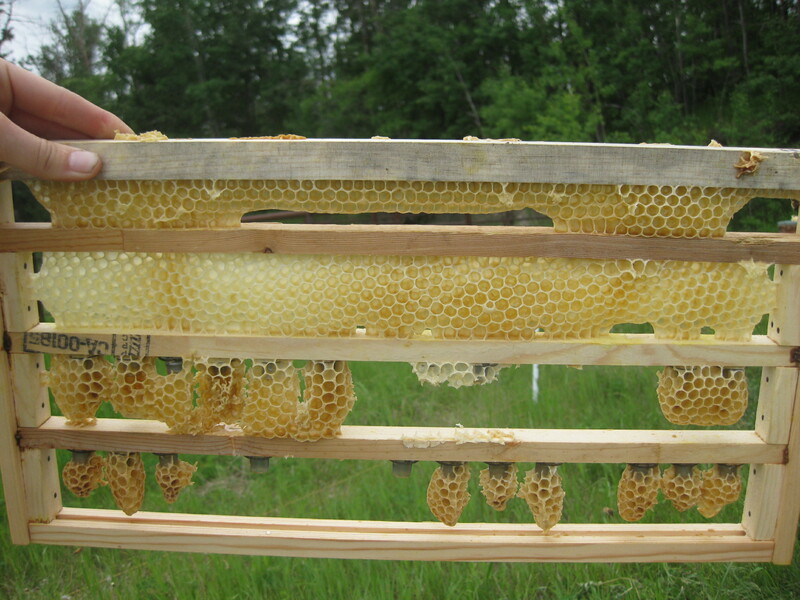 When making new hives, about a week before the nucs are built the queens need to be grafted. This is a rather complicated procedure that some other website will explain better than I could. But basically, I transfered barely visible larva from a frame of brood into plastic queen cups and placed them in a swarm box, a box stuffed full of bees. After 24 hours I transferred them into the upper brood chamber of a strong hive in my apiary. I first made sure that hive’s queen was trapped in the bottom box with a queen excluder so she wouldn’t get into the queen cells and destroy them. 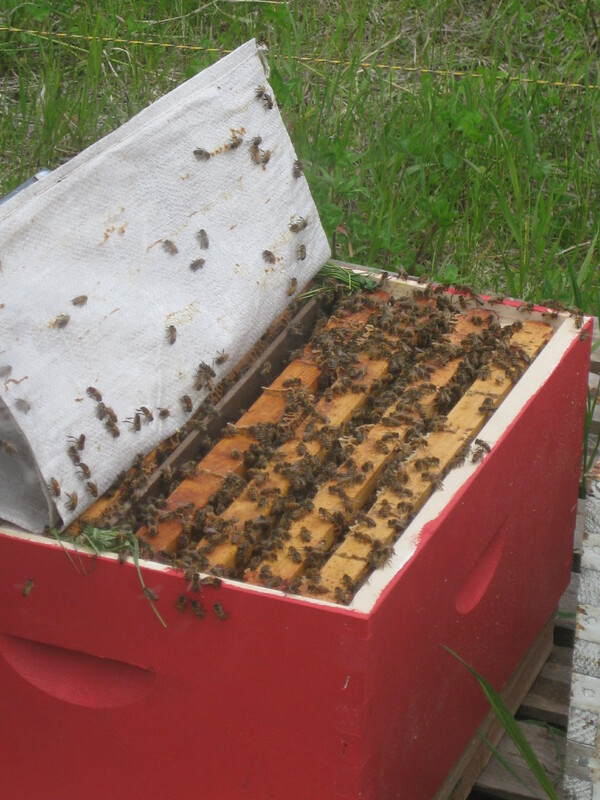 The queen cells mature for ten days in this hive, after which time I placed them in the nucs to hatch. This is a photo of the frame of drawn-out queen cells after ten days. 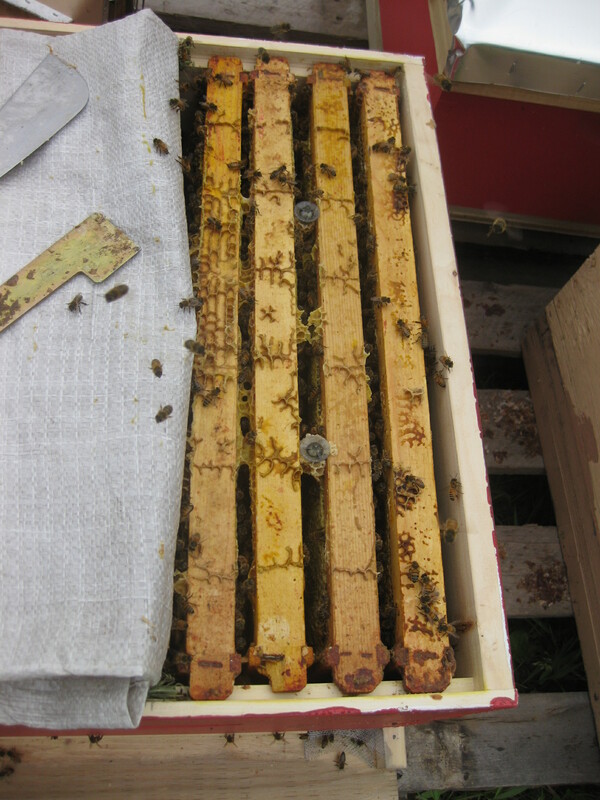 The cells are hanging from the bottom two bars; the top two bars were empty space for the bees to put wax in. A caveat: this is the first year I’ve bred queens and the cells don’t look the greatest! This is the specialized frame for breeding queens. Each cell on the bottom will hatch a queen. There is too much wax on all the cells. At the time this photo was taken, I’d already put the best cells into nucs. The rest, the ones you see here, were covered with too much wax. I think the mistake came when I put a box of foundation above the box containing this frame so the wax bees were concentrated in the area and got carried away drawing out wax. Putting the queen cells in the nucs. 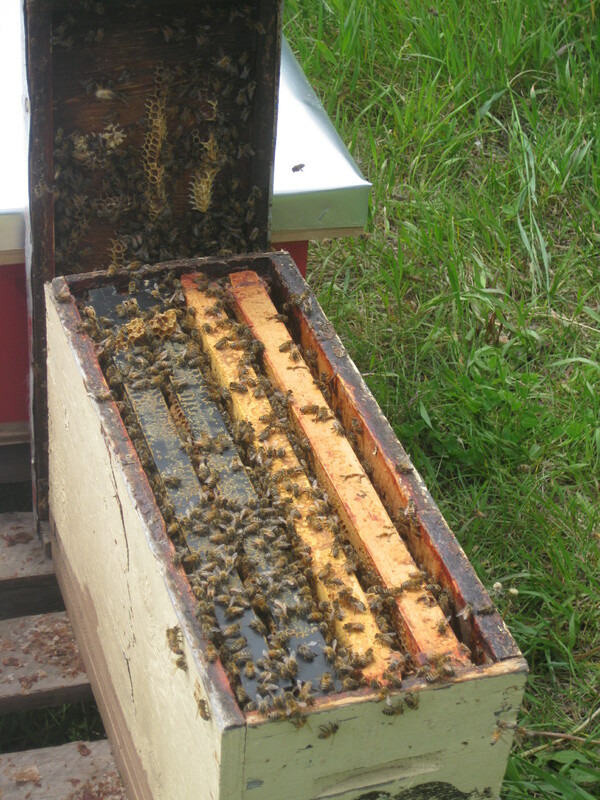 Two or three queen cells are placed in the nucs in case one fails. Now let’s back up a minute and I’ll show how the nucs are built. Two days before I put the queen cells in, I selected frames of brood from my hives and put two or three frames of brood into four frame nuc boxes. I also put in one or two frames of honey and pollen. Here I’m going through the bottom brood chamber of one of my over-wintered hives selecting frames of brood to place into the nucs. The nuc is on the far left, the red box. A completed nuc. This four-frame nuc is in a standard sized box that I divided with a sheet of melamine so I could fit two nucs in one box. I used a feed bag as an inner cover to minimize the chance of a queen from one side getting into the other side. With the feed bag I can also open one nuc without bothering the other one. This is my other type of nuc box. It’s a standard sized box cut in half. The advantage of this kind is there’s no chance of the queens mixing and killing each other and they’re easy to move around because they’re tiny. But they are specialized equipment: they can’t be used for anything else but nucs. I checked the nucs yesterday and they all have eggs in them now. This means the queen cells have hatched, the virgin queens were successfully mated and they made it back to the hives to begin laying. So there you have it, a crash-course in queen breeding and nuc building. There are lots of other places on the internet that provide more information if you’re interested in learning to do this too.